Early Christmas Eve I received a phone call from Wesley Price, one of PM’s picture editors. Price told me he wanted a good holiday picture, something with plenty of OOMPH. Lots of Christmas spirit in it. in other words a masterpiece. Jokingly I replied you just couldn’t order a picture like that, like you would a box of cigars. It had to happen. However, I asked him if he had any suggestions. He suggested that I get the picture in for the first edition. I left police headquarters in my car at 2:30 Christmas morning. I turned the two radios on. One the regular broadcast receiver, to get some holiday music to put me in the mood; and the other radio, a police short wave receiver to get the police signals so I would know what was going on. The first police call I picked up was for West and Bank Sts. When I got there I found a car with a Jersey license, turned on its side, with a cop on top of it. Nobody seemed to be hurt. Soon a towing wagon arrived to take the car away. I made a shot of it and was on my way. Then I picked up six fire alarm signals. They were all false. I didn’t think Santa did that. Then I stopped at the All Night Mission at No. 8 Bowery. [Not the still extant Bowery Mission.] Every night in the year about 100 hopelessly beaten and homeless men sit on benches and sleep as best they can. On the way out, along a big stove near the door, I noticed a pair of stockings, turned inside out, hung to dry. 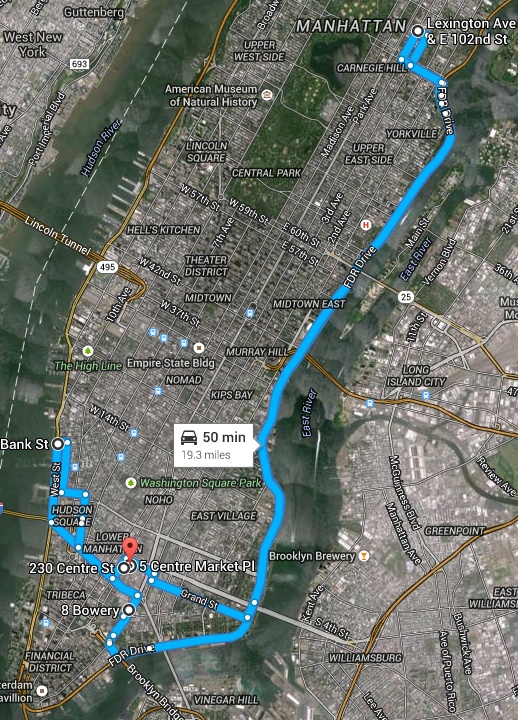 Next I picked up a police alarm for 102nd St. and Lexington Ave. When I got there I found a man had been stabbed to death and was lying on the corner. From the St. John’s Episcopal Church, on the opposite corner, came the sound of organ music and the singing of the Christmas worshipers. I made a shot of the scene and started back to police headquarters. 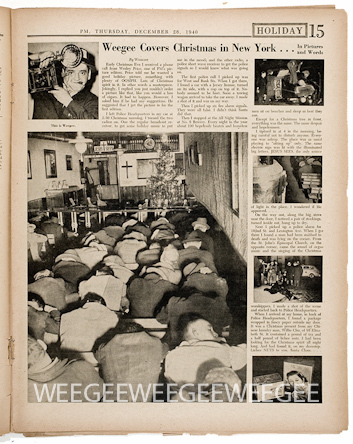 Weegee’s Christmas day journey (on a Google Map), might look like this.